A first-of-its-kind research project led by Microfinance Opportunities (MFO) in partnership with Fashion Revolution and C&A Foundation gives the most comprehensive picture yet of the living and working conditions faced by female garment workers in Bangladesh, Cambodia and India. Over a period of 12 months, researchers visited 540 workers (180 per country) at their homes to learn about what they earn and buy, how they spend their time each day and what their working conditions are like. The report highlights that living and working conditions of female garment workers varies greatly between countries. Of the three countries covered in the study, Bangladeshi women earned the least per hour — about half what the women in the other two countries earned. Nevertheless, in the other countries there was similarly opaque data when it came to base wage rates and overtime pay. On average, they worked 60 hours a week and earned an hourly rate of 28 taka (the equivalent of $0.95 in purchasing power parity). They earned less than the minimum hourly wage 64 percent of the time and there was significant evidence to suggest that the more they worked, the less they earned. Outside of work, men controlled earnings that were spent on basics such as food and rent and rarely improved a household’s quality of life. Cambodia’s workers sought overtime hours to boost their incomes, but in many cases, were not paid a legal wage for these hours. On average, they worked 48 hours a week and earned an hourly rate of 3,500 riels (the equivalent of $2.53 in purchasing power parity). Despite earning the minimum wage and supplementing their income with overtime hours, most workers still faced financial strain, and at certain points throughout the year this resulted in limited access to quality food and medical care. India’s workers — a sample of export-oriented factory employees in the southwest of Bangalore — typically earned the legal minimum wage or higher and paid into pension and state insurance programs. On average, they worked 46 hours a week and earned an hourly rate of 39.68 rupees (the equivalent to $2.27 in purchasing power parity). They were often exposed to verbal abuse by their supervisors and relied heavily on income from their husbands or other household earners to meet their financial obligations, but lived in comparative comfort to workers in Bangladesh or Cambodia. “By listening to their stories, we identified patterns of behavior within and across countries. This gives brands something to consider above and beyond their margins when deciding where to make their clothes. Their decisions have a real and meaningful impact on the lives of these women and their families,” said Eric Noggle, Research Director at MFO. The projects’ findings are effective tools for workers, factories, brands and governments to make, change and leverage positive movements in target countries as many of them continue to source clothing from factories employing workers who struggle to make ends meet. This is an opportunity for key global stakeholders to work collaboratively and bring about systemic change in the garment industry. It was the only package Natalie Bushaw opened on her birthday, and it didn’t disappoint. It was her Super Bowl Crew 52 uniform, a major haul of technical clothing and winter gear worth hundreds of dollars. “It was the perfect gift,” she said. Like more than 10,000 other volunteers, Bushaw had been anticipating this moment ever since spying the uniforms at Crew 52 orientation in November. She and her fellow volunteers picked up their uniforms last week upon completing their training at Crew 52 headquarters — aka the old Sports Authority store in downtown Minneapolis. However, they are not allowed to wear their new clothes until their first volunteer shift. During the 10-day Super Bowl LII festivities, Bushaw and the others will be stationed at the airport, in the skyways and along the streets of downtown Minneapolis. So the Minnesota Super Bowl Host Committee is outfitting them with eight-piece uniforms designed to keep them comfortable. That includes a long-sleeve polo, fleece, lightweight puffer and wind-resistant shell jacket. There’s also a scarf, socks, stocking cap and pair of “Bold North” mittens. Kelsey Little tried on her Crew 52 gear last week in downtown Minneapolis. The Northern Lights reference is most evident in the polo, a purple shirt flecked with tiny stars. And then there’s the unmistakable silhouette of U.S. Bank Stadium, a logo-like graphic unifying all eight pieces. As for the kindness theme, the ensemble is topped off by a knitted beanie from Minneapolis-based Love Your Melon, which donates a portion of profits to pediatric cancer research. 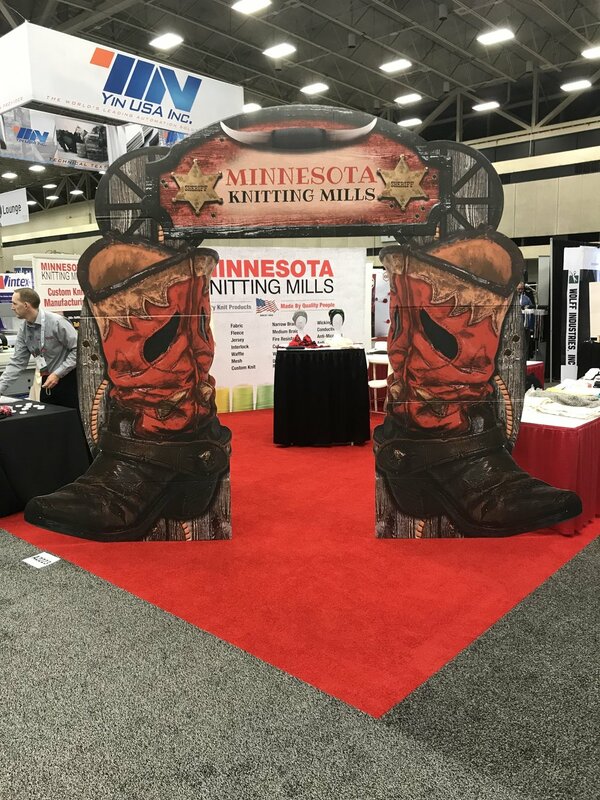 Manufactured by Minnesota Knitting Mills in Mendota Heights, with a reflective front safety patch by 3M, the hats are also considered a model of Minnesota craftsmanship. When visitors arrive, Bushaw and her fellow volunteers will stand ready to represent their state — through action and uniform. During the event, Will Duncan of Will Duncan and Associates (WDA), whose group has assumed daily management and operations of the not-for-profit organization, laid out his made-in-America vision and growth agenda for the association. He, along with SEAMS’ new marketing associate, Jerry Inman of Demand Worldwide, NYC, also offered a peek at and value proposition of SEAMS’ newly revamped website and visual brand identity, which was subsequently launched and announced to the trades. “But the biggest reason this conference was special to me was that we had the opportunity to celebrate a person that for more than 20 years has been the driving force behind this association,” said Duncan, SEAMS’ executive director. That would be Sarah Friedman, who announced her retirement as the group’s executive director last year, before WDA was voted by the board to manage the association beginning this fall. To honor her devotion and service, Friedman was presented the newly established SEAMS Lifetime Achievement Award – a surprise to her and many association members until the announcement was made during a dinner presentation. Going forward, SEAMS’ Person of the Year Award will be named in her honor, Duncan announced. Visibly moved, Friedman thanked membership after being feted with the award by SEAMS President Jeremy Wootten, president of HomTex, Inc., Vinemont, Ala. Under Friedman’s leadership, SEAMS transformed itself from a small, regional apparel manufacturing group into the widely recognized National Association for the Sewn Products Industry. With more than 200 member companies, SEAMS today consists of America’s foremost fashion brands, retailers, manufacturers and textile providers. In addition to managing more than 30 industry networking events and conferences, Friedman oversaw the development of the Supply Chain USA pavilion that has become a key destination for attendees to the biennial Texprocess Americas trade show. Her business matchmaking efforts brought immeasurable value to SEAMS members and sourcing professionals worldwide, Wootten noted. During the group’s board meeting, Matt Poovey, president of Champion Thread, Gastonia, N.C., was elected president to succeed Wootten for a two-year term. “This is a very exciting time for our industry, and it’s a very exciting time for the SEAMS association,” Poovey, who will officially take the reins on January 1, told attendees. “We talked today about building a bridge and we are right at the point of doing that. The global supply chain has changed, and SEAMS is in perfect position to take advantage of all the changes in the supply chain. SEAMS’ newly redesigned website offers quick and easy access to essential information for the resurgence and growth of made in America initiatives, according to Inman. The new visual branding and logo “elevate the company’s corporate identity while preserving its rich heritage and supports its unique network of manufacturers, suppliers, vendors and retailers/brands,” according to a SEAMS’ announcement. As explained during the meeting, the website also delivers stronger brand storytelling for the new digital world with a comprehensive member search, extensive resource section, news and events and industry educational best practices. “We are excited about the launch of our updated brand, new website and the robust information it provides the industry,” Wootten said. “SEAMS is dedicated to promoting sound economic growth for our members and leading the resurgence of ‘MADE IN AMERICA’ on the world stage. We believe that this new site will allow our visitors to have a very informative experience as we continue to grow and increase our member’s market presence. “This fresh new look for the association with its mobile-responsiveness and easy-to-navigate design, improved design features and educational resourcefulness, really adds business value for our membership and sewn products industry at large,” he added. The new site features the industry’s only “Make Something / Source Something Power Search” to quickly find its U.S. member base, Duncan added. “And the new brand reflects who we are as an association and giving back, the market we serve, and the innovation that comes from the members,” Duncan said. Inman further explained the changes, made to help SEAMS be at the forefront of the reshoring movement. Sheryl Sandberg, COO of Facebook and founder of the Lean In Foundation, posted a video from Love Your Melon for National Manufacturing Day. Zachary Quinn of Love Your Melon discusses how Facebook is beneficial to business growth. 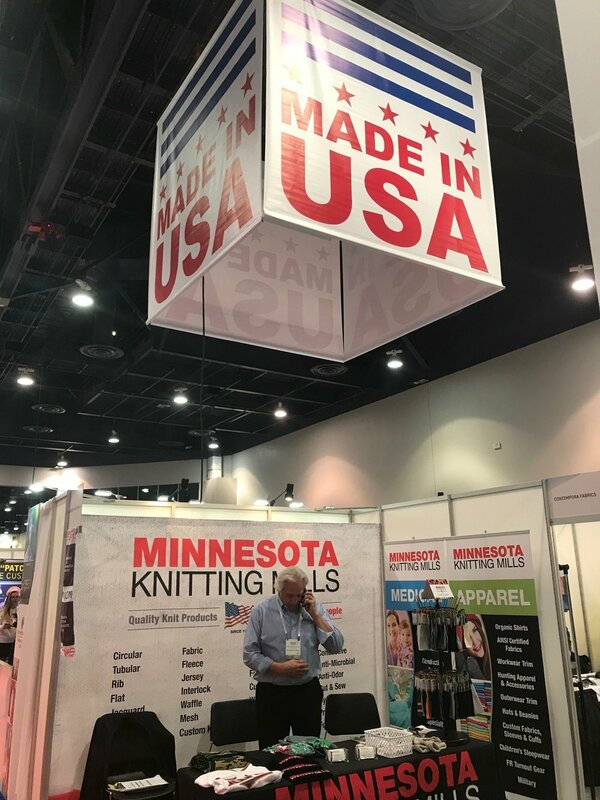 In this video, Minnesota Knitting is mentioned as the manufacturer of the beanies. Check out the video here! MINNEAPOLIS, MN — When 10,000 volunteers hit the streets to welcome the world to Minnesota, they’ll be wearing a Minnesota-made custom Love Your Melon beanie. The "Crew52" exclusive beanie is the first piece of a full winter-ready uniform provided free of charge to all Crew52 volunteers participating in the 10 days of Super Bowl festivities, Minnesota Super Bowl LII Host Committee. The Love Your Melon beanies were knitted by Minnesota Knitting Mills, a Mendota Heights-based company that was founded in Saint Paul more than a century ago. Love Your Melon, in partnership with the Minnesota Super Bowl Host Committee, will continue its mission by giving more than 5,000 Super Bowl winter beanies to Minnesota children who are battling cancer, according to a news release. The only way to get your hands on the special-edition Love Your Melon beanie is to become a Crew 52 volunteer, and interested volunteers need to act fast. Applications will close on Sept. 27, and interviews will end on Sept. 30. We are looking to fill some general labor positions in various areas of our company. Please mailto:janah@mnknit.com for questions. MENDOTA HEIGHTS June 16, 2016 -- Minnesota Knitting Mills has been selected for the 2016 Best of Mendota Heights Award in the Manufacturers category by the Mendota Heights Award Program. This marks back-to-back selections as MKM was also selected in 2015. Each year, the Mendota Heights Award Program identifies companies that we believe have achieved exceptional marketing success in their local community and business category. These are local companies that enhance the positive image of small business through service to their customers and our community. These exceptional companies help make the Mendota Heights area a great place to live, work and play. Various sources of information were gathered and analyzed to choose the winners in each category. The 2016 Mendota Heights Award Program focuses on quality, not quantity. Winners are determined based on the information gathered both internally by the Mendota Heights Award Program and data provided by third parties. The Mendota Heights Award Program is an annual awards program honoring the achievements and accomplishments of local businesses throughout the Mendota Heights area. Recognition is given to those companies that have shown the ability to use their best practices and implemented programs to generate competitive advantages and long-term value. Thank you again for your help as we pedal to fight multiple sclerosis. The MS Society is making great progress in research and treatment, while providing much-needed services to those living with MS. We couldn't do it without you!